Keto Low Carb Creamy Tuscan Chicken, you guys this recipe is the business! The sauce is cheesy, creamy and very moreish, we couldn’t get enough of it! 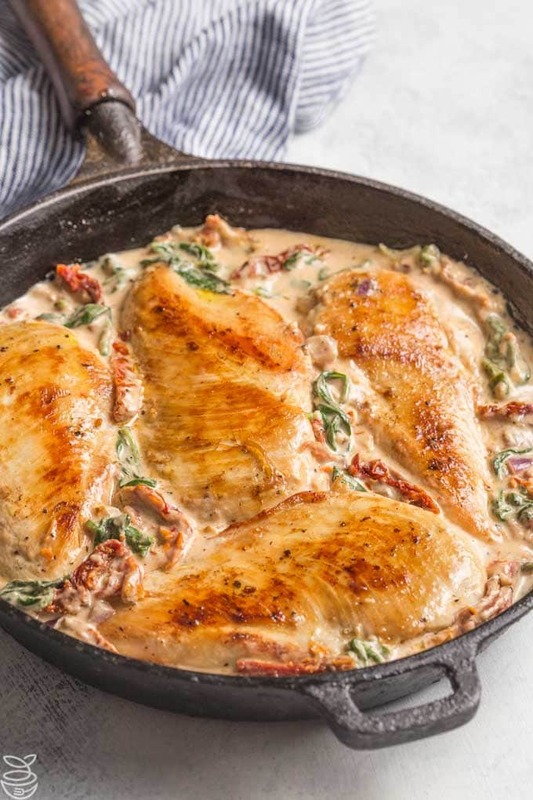 I added a small amount of sun dried tomatoes to my low carb Tuscan Chicken recipe because even though they can be a little higher in carbs, you really only need a small amount as they have an intense flavor that really adds something special to this dish. You can serve your keto Tuscan chicken with a side of green beans, broccoli or roasted cauliflower. 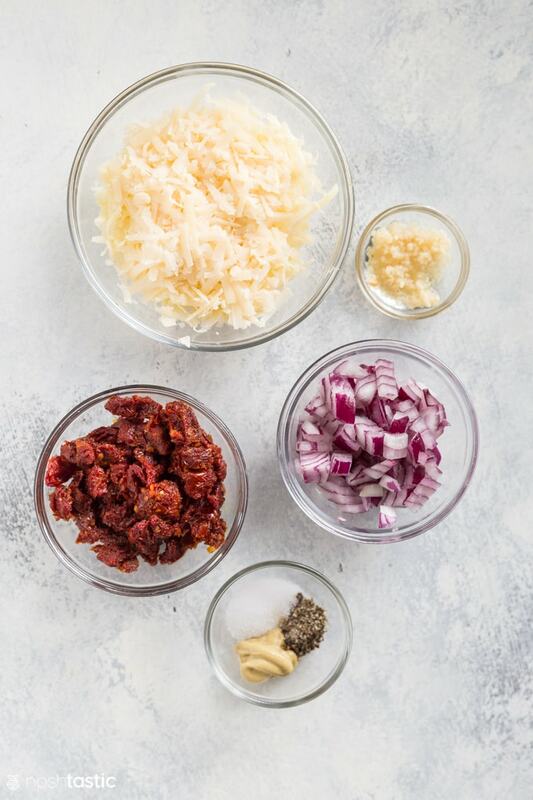 Start by seasoning your chicken with salt, don’t skip this step as it really adds flavor to the finished recipe. Then heat a little olive oil in a heavy skillet, I like to use a well seasoned Cast Iron skillet for this as it works really well, and then add the chicken skin side down and leave it alone for at least 10-15 minutes over a low medium heat (you don’t want to burn it) and as the skin crisps up eventually it will unstick from the skillet without tearing the skin and you’ll be able to turn it over. Turn the chicken and continue to cook it on the other side until the chicken is cooked through, then remove from pan. Now add the onions, garlic, and cook for a few minutes until soft and translucent. Then add the chopped sun dried tomatoes, spinach, and stir for 30 seconds. And finally the cream, some pepper, bring it to a boil then add the Dijon mustard, cheeses, and reduce to a simmer over a medium heat until the sauce has thickened, then add back your chicken and spoon over the sauce. 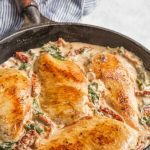 Keto Low Carb Creamy Tuscan Chicken, it's deliciously cheesy and creamy! Season the chicken on both sides with a little salt and let it sit for 15 minutes. Add the olive oil to a large non stick, or cast iron skillet, over a medium heat. Cook chicken thighs skin side down (if using thighs) for about 12-15 minutes to crisp up the skin, keep it on a medium-low heat so it does not burn. If using chicken breasts brown it works best if you cut large pieces in half lengthways, cook on each side for about 6 minutes per side to brown. 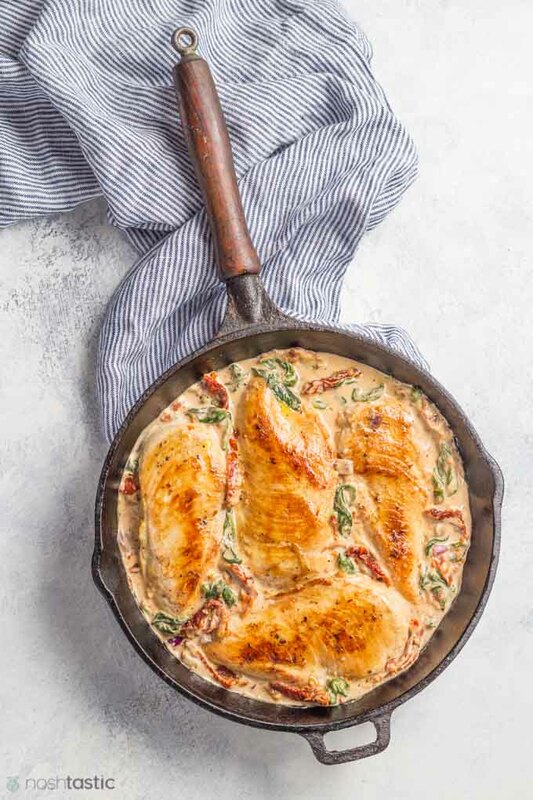 Turn the chicken and continue cooking over a medium-low heat for a further 15 minutes or until fully cooked, then remove from the skillet. Add the red onion and garlic to the same skillet and cook until translucent over a medium low heat for three to five minutes until translucent. 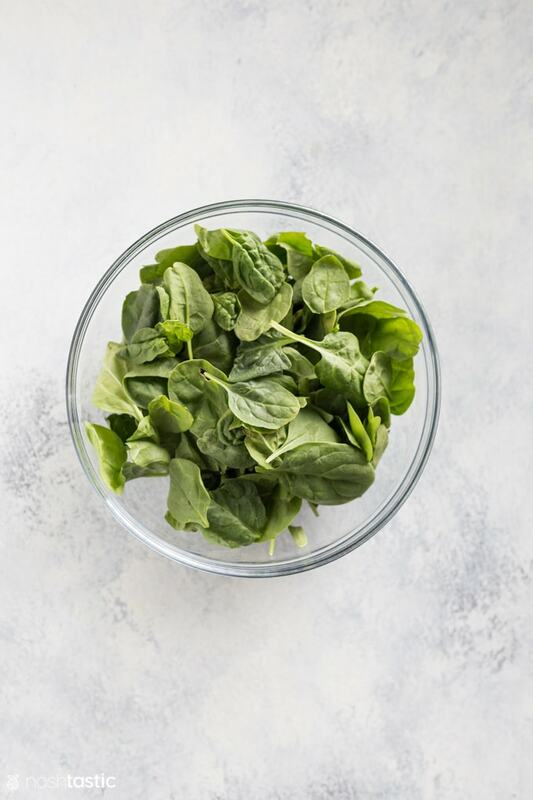 Add the chopped sun dried tomatoes, spinach, and stir for 30 seconds. Add the heavy cream, black pepper, and bring it to a boil then add the Dijon mustard, cheeses, and simmer over a medium heat until the sauce has thickened. Taste the sauce and season more if needed. Add the chicken back the pan and coat in the sauce and reheat gently if needed. 8g net carbs per serving, makes 6 servings. Thinking about taking this for a group weekend. Does this reheat well? Hi Bettie, yes it does reheat well but you need to do it slowly over a low heat for best results. Could I use chicken breasts? Only thing i found was the cream made it very oily. Can i use sour cream instead? Hi Liona, did you cook the cream for long enough to thicken the sauce, and did you use heavy cream? If it thickens up it should not be oily. I don’t know if sour cream will work in the same way as heavy cream for the sauce, I’ve not tried it. I’ve been on the Atkins diet for 2 1/2 months now and I’ve already lost 25 pounds but I have 20 pounds to go to get to my healthy weight which I will gradually lose. Thank you so much for these tasty low-carb recipes! I have mixed connective tissue disease, lupus, etc. Changing my diet has really helped with inflammation, my energy is improving and I have a little less pain which is great! Avoiding carbs, processed foods, sugar and drinking enough water really makes a huge difference. These types of low-carb recipes made my decision to go low-carb/no sugar so much easier and to make this a lifestyle change for me and my family. My kids and husband are eating less and less processed food. Thank you again for your recipes! Hi Anna! I’m so pleased that you feel so much better with your diet change and that you are enjoying my recipes, that’s just wonderful! Good catch! the photo was added in error, a hazard of making multiple chicken recipes in the same day. You can make this with thighs or chicken breast, whatever you prefer and I’ve updated recipe to reflect that.